The lovely ribbon fan palm - with fan-shaped leaves that split into long, graceful ribbons - is much tougher than it looks. Ribbon fans have uniquely long leaves that give a delicate appearance. But these palms can take whatever cold temperatures Mother Nature dishes out in South (and even Central) Florida. This is a solitary palm...it grows a single trunk, slim, straight and upright. When young, the palm's fronds will drape to the ground. A trunk will form as it matures. Very nice planted alone, ribbon fans can be especially attractive planted in groups. The ribbon fan can reach 30 feet or more in height but it's a slow grower. Although drought-tolerant once established, this palm keeps its good looks best with regular watering. It's moderately salt-tolerant, and very cold-tolerant, even into Zone 9A. Place this palm in an area protected from strong winds to keep the "ribbons" from becoming tattered. 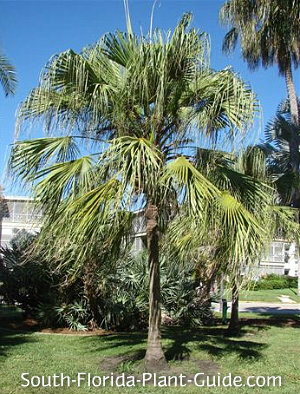 These palmns prefer full to partial sun, and a well-drained area so they can dry out between waterings. Fertilize three times a year in spring, summer and fall. Ribbon fans are not self-cleaning palms - you'll need to trim off browned fronds (though only occasionally) while the palm is still short enough to reach. Dried leaf bases ("boots") will need to be manually removed as well. They'll eventually fall off on their own, like old fronds, but the look is much cleaner and prettier if they're removed as the palm matures. 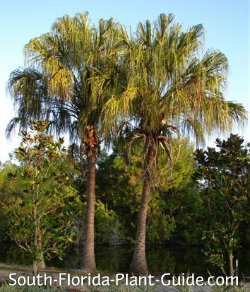 Because these sturdy palms grow straight and tall, you can plant fairly near the house - come out 6 feet or more. If the palm's head clears a structure like a fence or wall, you can plant as close as 3 feet out. Young ribbon fans work fine in large containers. COMPANION PLANT SUGGESTIONS: Thryallis, plumbago, dwarf firebush, cocoplum, red fountain grass, nandina, clusia guttifera, and beach sunflower.